A well groomed and neat establishment with a self catering cottage consisting of two double bed rooms and one single bed for sleeping five people.A separate double bed single room with on - suite bathroom is also available on the premises. 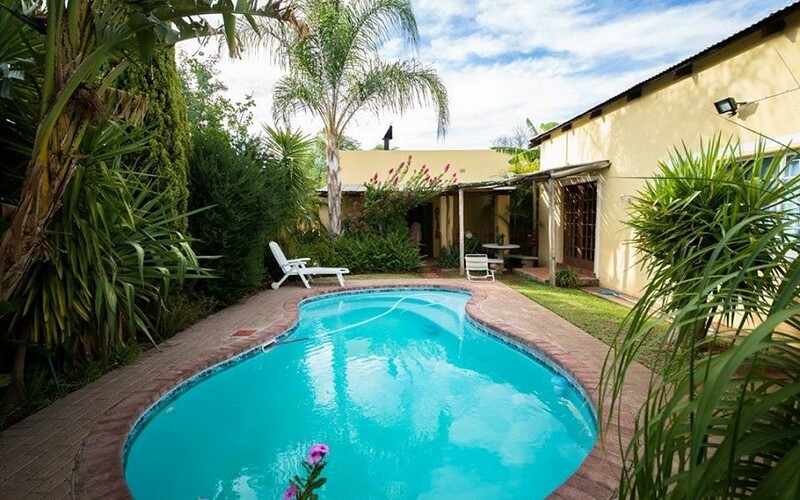 Air conditioning and DSTv available in both areas.Swimming pool available in secluded area for guests. Braai facilities also available. The spacious apartment has an air-conditioned open-plan living area with comfortable couches and a television with DSTV (limited channels). A sleepercouch in the living area, offers additional sleeping space. Outside is a small swimming pool for the hot days in summer. The apartment has two separate double rooms, ideal for a group of friends or a large family. Both rooms are equipped with double beds and wall-mounted heaters. Both rooms and the living area are equipped with air-conditioners. One bathroom with a bath and shower, services the apartment. This lovely appointed room with it's own private entrance, has a double bed and can accommodate up to two guests. Full DSTV and air-conditioning is only two of the luxuries we offer. The room has an adjoining bathroom with both a bath and shower. Breakfast can be arranged at prior notice.